Dishes & Dirt: Thanks to Everyone who attended our first networking and tasting event at Old Town Social! Thanks to Everyone who attended our first networking and tasting event at Old Town Social! A few kinks to work out. But in terms of it being our first, it was a success. Our next one is planned for March at a different restaurant. Stay tuned! The FamilyFarmed.org Financing Farm to Fork Conference supports the local food movement by encouraging investment in farm and food production, processing, and distribution businesses. 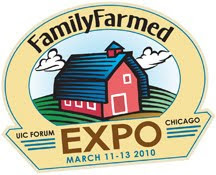 The FamilyFarmed EXPO is the leading Midwest trade show connecting farmers and food producers with trade buyers. A Locavore's Delight! You won't want to miss the fun at this year's Localicious Party. It will feature scrumptious local food and libations, great networking, an opportunity to connect with leaders in our community. Rick Bayless leads our lineup of all star celebrity chefs, speakers, authors, food artisans and, of course, family farmers! Spend the day enjoying a wide selection of local food, gifts and great information to help you eat healthy year-round, while supporting local farms and businesses.